Increase your customer satisfaction by the integration of TENIOS automatic-speech-recognition. Navigate your customers to desired information using preset keywords. Automatic-speech-recognition - also automatic-voice-recognition (AVR) - refers to the recognition of human speech. Within the speech analysis, the computer uses a database of stored words. The use of deep learning methods enables the system to expand this database independently – this is called Artificial Intelligence (AI). 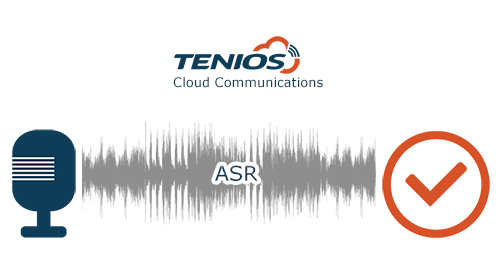 TENIOS Cloud Communications integrates the AI-based software into its navigation options: ASR can be included at the desired places in the routing plan of your announcement loop and simplifies navigation for your callers. The method of speech recognition is assigned to the speech analysis. Information captured through voice is analyzed using ASR software. During this process, the system filters individual keywords and builds up connections. In intelligent systems, the database of words is increasing continuously through multiple speech input. Machine learning makes word recognition more and more accurate. Typical areas of application in the private sphere are the writing of text messages or the using of search engines via smartphone. In the business environment, the language technology is used in automotive engineering and in call centers for example.